Hubby and I had to reinforce our chicken coop because the puppies were jumping up against it. Our dogs and chickens do not mix. Since we had cut holes in the hardware cloth there a weak spot had been created. 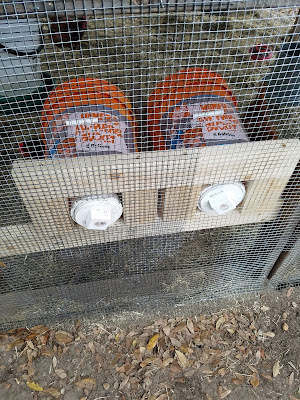 So we took to bracing and reinforcing that area of the coop and I figured this was a good time to show you how we turned 5 gallon buckets into nesting boxes. When we first got the chicks and built the coop we weren't really sure what to do for nesting boxes. We had been using 5 gallon buckets as a shelter for them to huddle up and keep warm when we first brought them outside. So it would be a natural fit to turn them into nesting boxes, unfortunately the chicks got in the habit of sleeping in them, so for many weeks we didn't have anything in there. 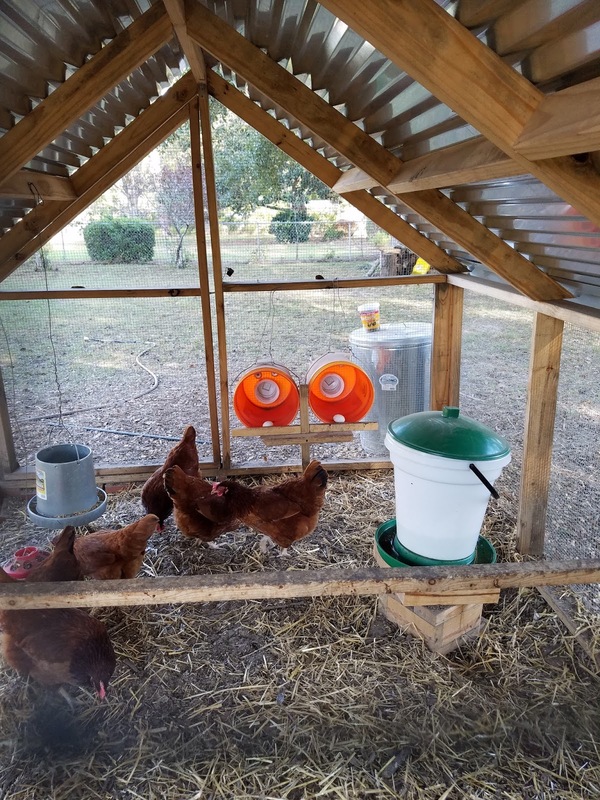 When we installed the buckets back in there the chickens didn't want anything to do with them, but they figured it out because they started laying their eggs in the buckets pretty quickly. Apparently chickens naturally want to lay their eggs in an enclosed place off the ground. People build and use all sorts of nesting boxes, but for us buckets were an easy option. which is used to help fund this blog. The price to you remains unchanged. 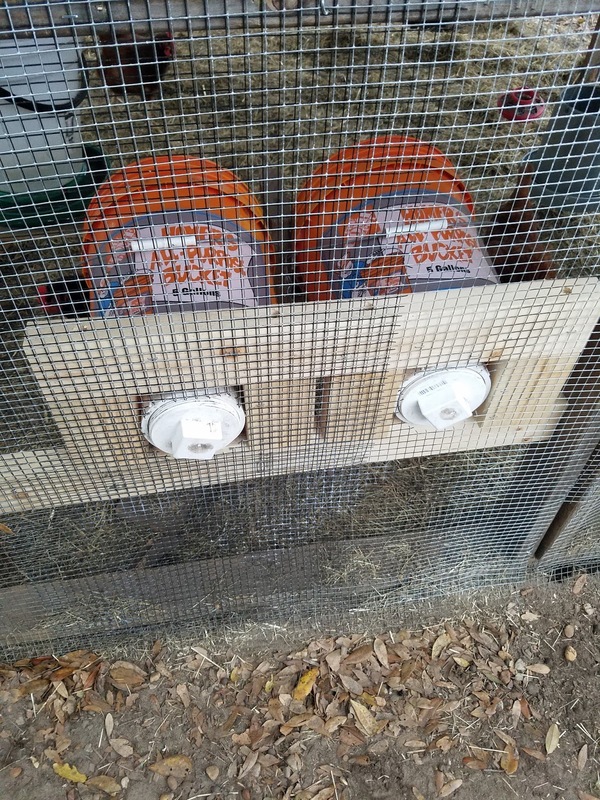 We knew we wanted the nesting boxes close to the door so that we wouldn't have to traipse through chicken poo every day to get the eggs. So we first decided to hang them from the front of the coop, near the door. That worked well, but we still had to go inside the coop and risk chickens getting out or stepping in chicken poop. You can see we made a wooden brace for the front of the nesting boxes. 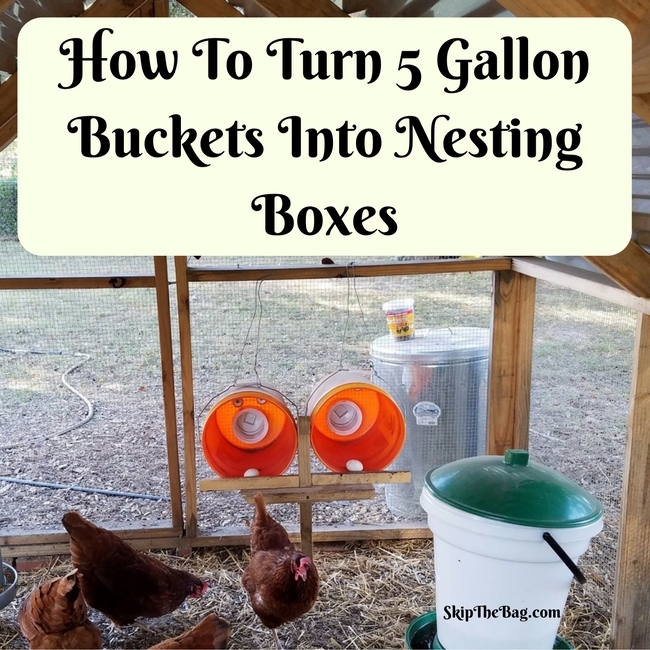 This provides a small perch for the birds to get in and out of the boxes and also provides a front stop for the eggs to prevent them from rolling out of the bucket. Since we had some problems with the chickens eating their own eggs, we have raised this brace so the buckets are at a slight upward angle, making the eggs roll to the back of the bucket. This, and the presence of ceramic eggs, help deter them from wanting to peck at the eggs. We hadn't tilted the buckets back yet and as you can tell they eggs are at the front just begging to be pecked. Fortunately the ones you see in the bucket are ceramic! Then one day when Hubby was wandering around a hardware store he found female adapters, a plug, a piece of PVC pipe and a coupling adapter. Using 4 inch pipe makes it large enough to easily fit a hand and egg through the hole. You could make it with 3 inch pipe, but it is far easier to reach in and pull out an egg if it is 4 inches. through the bucket, female adapter and lid on the outside. Hubby is demonstrating how he put them together. 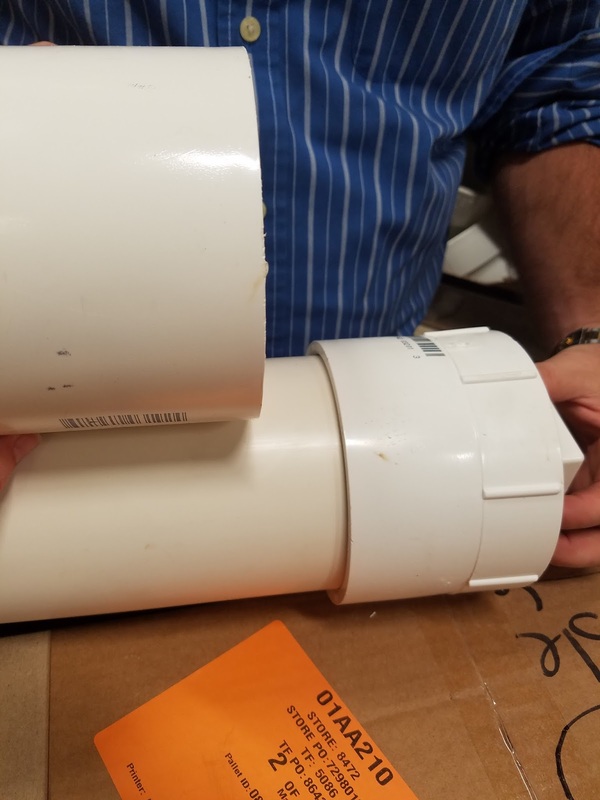 The large object on the left on top is the coupling adapter. He cut it in half to make it more narrow. It sits on the inside of the bucket and keeps the whole piece from just falling out of the bucket. 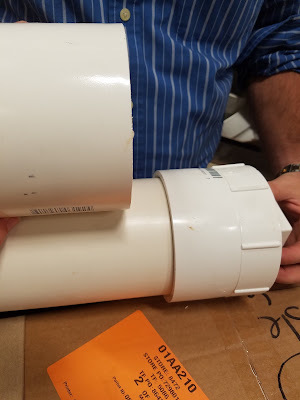 The long piece on the bottom is the PVC pipe, it needs to be cut down to an appropriate size, about 5 inches: 2 inches for the coupling adapter, 2 inches for the female adapter and a little space for the bucket. To cut the PVC pipe he says a hack saw would work, but he used his band saw. 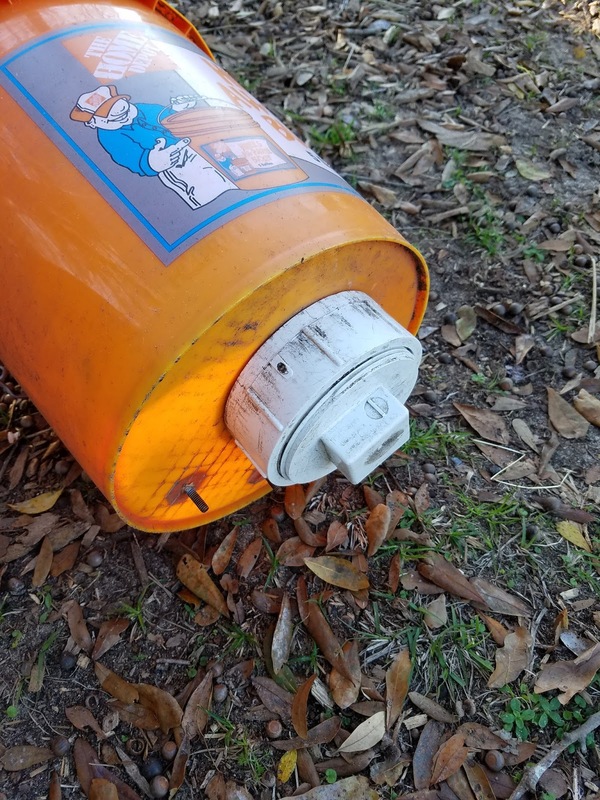 Then on the outside of the bucket is where the female adapter and lid would go. The lid keeps the bucket closed from predators and dogs. He cut holes in the bucket with a reciprocating saw or a hole saw and we used tin snips to cut holes in the hardware cloth. Unfortunately it created a weak spot so when the dogs would get get excited and jump against it it created a tear through the hardware cloth. We ended up taking down the entire section of hardware cloth and adding braces. We braced along the bottom of the buckets and around the holes. Since the pups created a tear in the hardware cloth we also had to replace that. We had enough to cover it, but not all in one piece. So you can see there is some overlap over the second bucket, which will hopefully make it even stronger. Finished product. Buckets are braced! Now that we've done this the coop is so much stronger in this area, and it is still easy to get the eggs out. 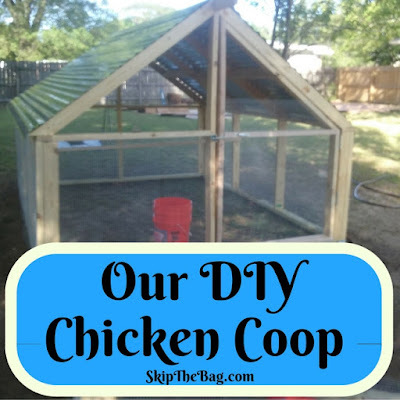 Pop on over and check out how we made our coop. 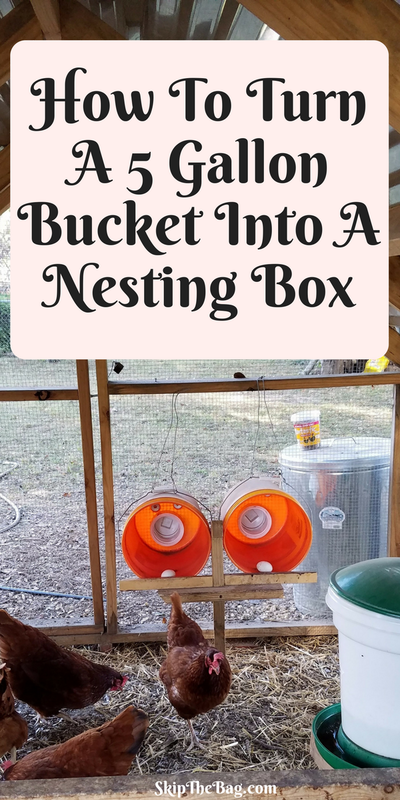 What do you use for your nesting boxes? Thank you! It makes it far easier to reach in and get the eggs in the morning and we don't have to worry about chickens escaping from the coop. I'll have to see if I can get a good picture. However it's just friction that is keeping it together. 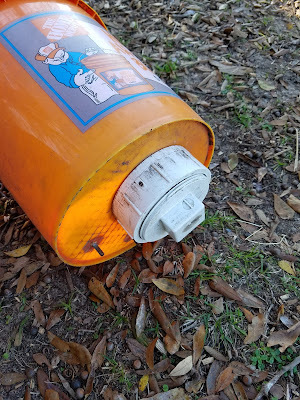 The coupling adapter holds it on one side of the bucket and the female adapter holds it on the other. The lid just screws in. So the forces are all circular, you are never really pulling at anything so the friction is enough to keep it together. I hope that helps. Ha! That's great! I love having chickens around. Good luck with yours. What an awesome idea, I really like how you used the PVC for easy access! Did you put bedding in as well? No we haven't had bedding and it's never been an issue. Hello. Your work was extremely remarkable, especially because I was looking for thoughts on this subject last few days. How can I make this and whats needed?